This Mickey Park FunJump is the best of all things Mickey. Not only does it feature Mickey and Minnie it also features all of their friends. 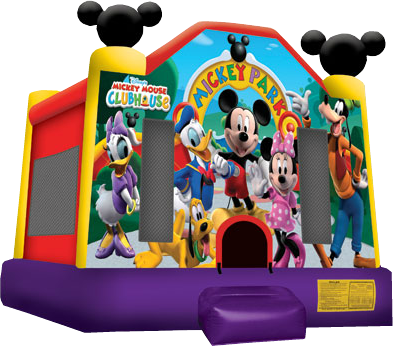 This jump is sure to satisfy your Mickey Mouse Clubhouse needs in one jump The weight limit for this jump is 500lbs. This rental's based price is for 6 hours. If additional rental time is needed we do offer overnight rental which is 25% extra.